If you slice a cone in half, what’s the proportion of volume in the lower half compared to its entirety? How many zeroes are at the end of 15 factorial? 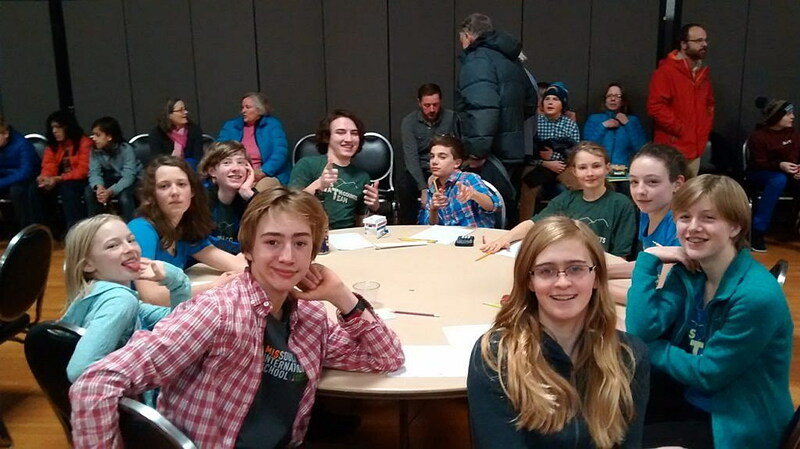 A team of students at Missoula International School whizzed through such questions and more last week at the Western Montana Chapter of the MathCounts Competition, taking top honors for the second year in a row. For head coach and former math teacher Michael Curtis, it wasn’t so much winning that mattered, but rather seeing all 20 students on the team inspired by mathematics. With 14 area schools and 140 students competing, seven students from MIS placed overall in the top 25 percent, earning the right to compete in the state competition next month at Montana Tech in Butte. One team from MIS placed first for the second year in a row while two students – Grace Gibson-Snyder and Georgia Walker-Keleher – won first and second place respectively as the competition’s top-scoring individuals. MathCounts, part of a national nonprofit organization, provides engaging math programs to middle school students in an effort to build confidence and improve their attitude toward math and problem solving. Winners have been recognized in White House ceremonies by U.S. presidents dating back to Ronald Reagan. The annual Montana competition includes several rounds, including a speed round and a team round. Calculators are permitted to solve some problems, but not all. Curtis once served as a math teacher but grew discouraged by his students’ lack of interest in the subject. But his interest in teaching has returned, thanks in part to the curiosity of the MathCounts team. For middle school students, the program comes at a crucial stage in their development, either solidifying their love for math or helping them overcome their fear of the subject. Curtis also applauded the success of other schools, including Sussex and Washington middle schools. “They’re always strong every year, and they set the bar very high for everyone,” he said.